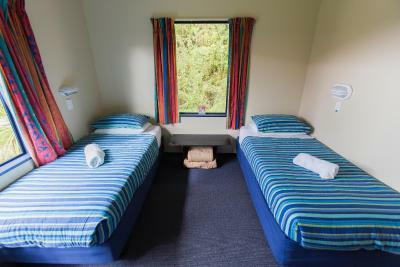 Lock in a great price for YHA Franz Josef – rated 8.6 by recent guests! Great hostel, clean, good location and friendly staff!! We had taken a double bedroom with shared bathrooms. Our room was on the first floor and there's only 1 bathroom (1 each for M and F) there, but at no point was it unavailable as I think perhaps there are plenty spread out on the premises. What I loved the most is the small little things they have thought through and provided. Like a small bench in the bathroom for dressing/keeping your stuff, extra mats to prevent overflow of water, small light for each person staying, towel stands in the rooms to dry your wet towels, well eqipped kitchen including free coffee, recipe books, etc, garden table with solar charging - you name it. The staff is super helpful and enthusiastic and you can get all info you need about walks/tours etc here. The location is super! 1 minute walk to all the restaurants and supermarket. Terrace walk where you can see Glowworms at night is just a 5 min walk. Really great hostel. Huge, well stocked kitchens, clean bathrooms, and the most comfortable beds we’ve slept in at a hostel. The receptionist was super friendly (and a great artist). The lounge area has a fire place, pool, and a movie room. Really like their conservation efforts (everything from solar panels to shower heads). Everything here was great! For a hostel there was a huge shared kitchen with lots of appliances. Staff was very friendly (thanks Caroline) and helpful. The rooms were quite decent and much cleaner than average hostels. Like that they had a poured flour in the barhroom (easily to keep clean). Good location in the main town, a few mins to walk anywhere. InterCity bus can drop you off/pick you up right outside. The large common room is really nice, especially the area next to the fire. Kitchen is big and well equipped. Room was fine too. They organised a pub quiz, which would have been a nice way to meet people (but I was too tired). Nice location, clean facilities, and simple check-in and out. Nice kitchen and eating area that we took advantage of for breakfast. Nice lockers inside the room, with an outlet inside them. We really enjoy our stay here, good location, clean and spacious room, Linda who work as the reception during our stay was really friend and helpful. it located perfectly in a quiet corner of the small town of Franz Josef, the staffs were kind and the kitchen was fully equiped for cooking. the surrounddings were quiet and nice. YHA Franz Josef This rating is a reflection of how the property compares to the industry standard when it comes to price, facilities and services available. It's based on a self-evaluation by the property. Use this rating to help choose your stay! Set against a backdrop of rainforest and mountain, YHA Franz Josef Glacier features solar hot water and power, a fully equipped shared kitchen and a guest lounge with satellite TV. Facilities include a pool table, BBQ area and a sauna. Up to 2GB of free WiFi is permitted per day for guests. 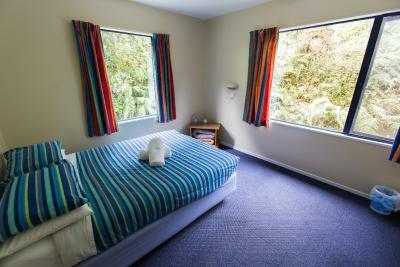 YHA Franz Josef Hostel is a 10-minute drive from the Franz Josef Glacier and a 20-minute drive from Fox Glacier. The travel desk can provide advice about the South Island and New Zealand’s West Coast. The guest lounge room features a flat-screen TV and DVD player with DVDs. The open-plan lounge/dining room includes a piano and open fireplace. Bike storage and a laundry/drying room are also available. YHA Franz Josef Glacier is a 2014 Winner – Certificate of Excellence (Trip Adviser) and offers backpacker accommodations with a choice of shared or private rooms. All rooms are heated and some have an private bathroom. 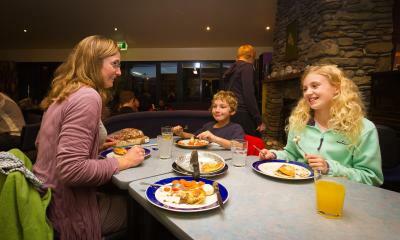 When would you like to stay at YHA Franz Josef? 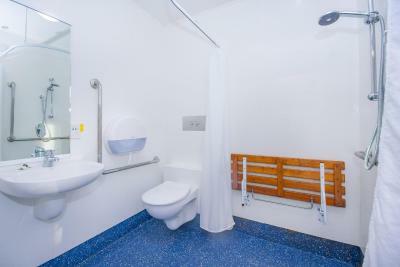 This heated room offers access to shared bathroom and toilet facilities. 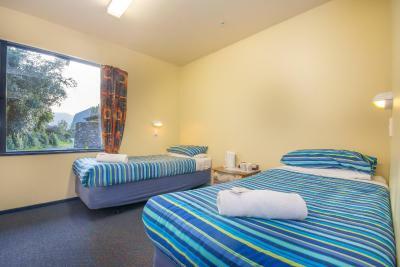 Private heated room with access to shared bathroom and toilet facilities. Free WiFi is included. Private heated room featuring an private bathroom with shower. Free WiFi is included. 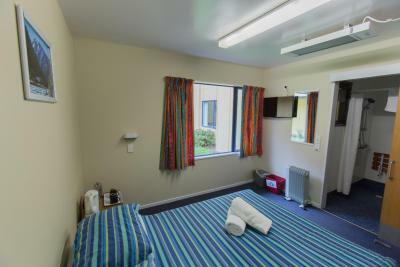 Private heated room with access to shared bathroom and toilet facilities. This twin room comes with 2 single beds. It also includes an private bathroom and free WiFi. This bed in dormitory comes with 2 bunk beds. It also includes free WiFi and extra blankets. 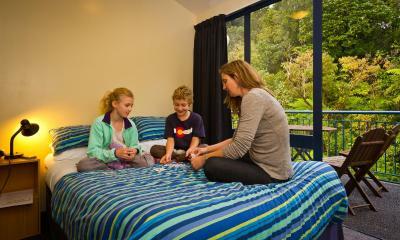 House Rules YHA Franz Josef takes special requests – add in the next step! 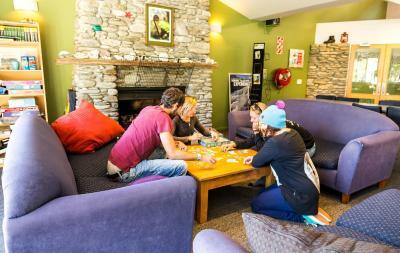 YHA Franz Josef accepts these cards and reserves the right to temporarily hold an amount prior to arrival. Please note due to limited availability at the time of booking, multi-share accommodations for two or more guests may be provided in separate rooms. For more information, please contact the property using the contact details found on the booking form. My room was very smelly and when I asked the cleaning lady to check on it, she knew about which room I was talking without me even mentioning it (Room 108). I had a lot of bites all over my body and when I asked if it could be bed bugs, they just said that bed bugs don't exist here and did not offer any further help. (I think it was bed bugs, but I did not get them in YHA Franz Josef, so no worries). Bathrooms were in great conditions and clean. Big common area to hand out and chill. I got moved into another room without requesting it, but the staff acknowledged that my room was too smelly. - Parking is limited. - Sauna is till 10pm only. Wished they could keep it open till midnight. 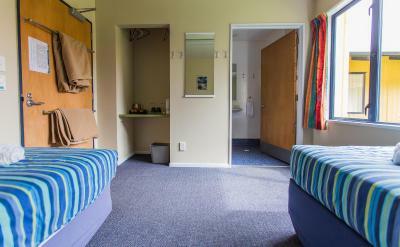 We had a private double room with ensuite which was quite comfy and clean. The kitchen area for preparation of food, and the adjacent dining space was large and well stocked, but there was no interaction with other people. Whilst eating at the tables ( which were organised to sear four ) we were not able to engage in any conversation. Perhaps other travellers were in groups, but this did seem rather a pity,and social media seemed to be the order of the day. Shame that. We had a lovely twin room with en suite, which was clean, comfortable and quiet. Ideal in every way. There was also a kettle, tea, coffee and milk in our room, so greatly appreciated first thing in the morning. Kitchen might be too crowded with hint of smell. But can see the staffs are trying their best to maintain. It's a busy small town anyway. Clean hostel with friendly staffs who will know this area and give you detail travel advice. very friendly and helpful staff, nice big kitchen! We enjoyed it a lot! No hot water. Very tiny room. Damp floor.